The creation of the Russian artist Mikhail Nesterov, “Two Frets,” gives the spectator an opportunity to reflect on many things. The idea of ​​painting was inspired by the verses of AK Tolstoy, besides the author was always fascinated by the illustration of fairy tales. The artist touches upon such themes as: love, loyalty, the fabulous attractiveness of nature, the beauty of the Russian soul. The name of the work comes from the Old Russian language, as previously the spouses were called “frets”. In the picture in front of the viewer, a young loving couple standing on the shore of a forest lake appears, young people look away into the distance, and they are full of hope and confident of their happiness. Ahead they have a long happy life, which they will spend in great love and loyalty, despite all the difficulties and enemies that they will meet. He will definitely become a strong wall for her, and the girl will be the keeper of the home. The symbol of the eternal love of young people is the image of two white swans in the lake. The fabulous atmosphere of Ancient Russia, which is only emphasized by national costumes, in which young people look even more attractive and innocent, is captivating in the picture. 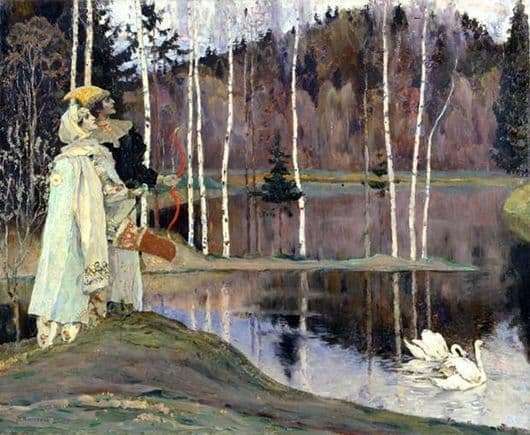 In addition to the idea of ​​love, Nesterov wants to show the viewer the beautiful soul of Russian nature, the attractiveness of which lies in transparent lakes, large forests and tall pine trees. In the present Russian “landscape of the soul”, the artist idealizes nature and wants to show the unity of man and nature, which most often occurs in Russian fairy tales. In addition, the picture gives a number of positive emotions from one naked eye, having understood the main ideas of the picture, the viewer thinks about the value of human feelings, national culture and the surrounding nature, encourages people to feel patriotism, pride in their native land.